Potato starch is used in various ready-to-mix and ready-to-eat products, such as baked goods, curry, and dessert mixes. It finds various applications in convenience food products, and the growing consumption of convenience food across the globe is expected to drive the growth of the potato starch market in near future. 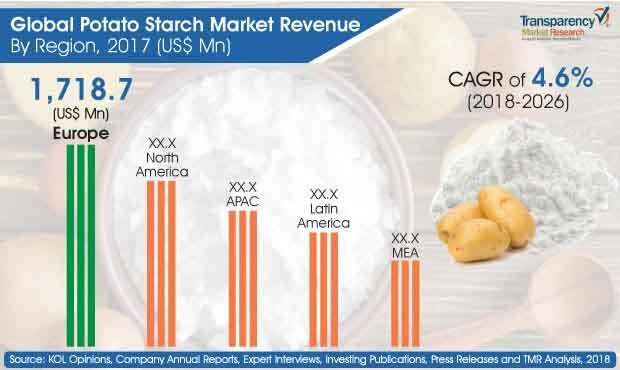 Global revenue from potato starch market was around US$ 5,000 Mn in 2017 and is expected to expand at a CAGR of 4.6% over the forecast period 2017-2026. By the end of assessment period, the global market for potato starch will possibly attain a value worth US$ 7,178.4 Mn. The global textile industry is expected to witness significant growth during the forecast period, especially in emerging markets such as China and India. This, in turn, is expected to increase the consumption of potato starch, primarily for textile sizing, and make a profound positive impact on the growth of the market. Starch is mainly used for textile sizing, especially for cotton yarns. It is preferred for the sizing of coarse and medium-count yarns. Starch forms the adhesive component during the size mix process, due to various factors such as Starch properties can be tuned as per requirement. Cost-effective when compared to other substitutes, potato starch is observed to be gaining significant traction on a global level. Major food manufacturers focus on using cost-effective acid-modified potato starch — a hydrolyzed starch — as an alternative gelling agent to replace materials such as gelatin and regular starch. This potato starch provides a unique texture and appeal to the end product resulting into a growth of the market over the forecast period. The paper manufacturing process utilizes potato starch. A single sheet of copy paper has a maximum of 8% starch content. Starch is used as a binder for coating formulation, which improves various properties such as smoothness, hardness, gloss, and whiteness. Increasing paper consumption across the globe is, in turn, expected to boost the growth of the potato starch market to a certain extent. Also, currently, manufacturers are producing potato starch as an adhesive, as it improves performance and enables the production of high-quality products in the most cost-effective way. Starch can be obtained from corn and other raw materials such as tapioca (cassava), rice, barley, and wheat. Cassava is considered as one of the world's important food crops and can be used as a substitute for corn in starch production. Cassava starch end products find application in the food and beverages industry, pharmaceuticals, textile, adhesives, and paper industries. One of the major challenges for the potato starch market is the price volatility of crop due to climatic changes. Irregularities in climate and seasonal variations affect crops due to critical and uneven rainfall patterns. Reduction in rainfall also adversely affects agricultural yields in many regions, which results in variations in input as well as output prices. There have been variations in the cost of energy, chemicals, and fertilizers. These fluctuations lead to a volatility in the prices of crops. Increased volatility is the structural issue for which players must find operational responses to secure margins in the long term. By type, the global potato starch market is segmented as modified and native. By nature, the market is segmented into organic and conventional. By end-use, the potato market is segmented into food industry, textile industry, paper industry, pharmaceuticals, personal care and others. By distribution channel, the market is segmented as direct and indirect. Furthermore, by indirect channel, the market is sub-segmented as store-based retailing and online retailing. On the basis of region, the market in Europe is anticipated to dominate the global potato starch market both in terms of value and volume in 2018. North America is expected to gain significant market share in revenue terms by 2026 end. This trend is attributed to the consumer dependence on potato starch as demand for convenience food is growing in this regions. Moreover, BENELUX is projected to exhibit significant CAGR in terms of value during the forecast period. Some of the major companies operating in the global potato starch market are Emsland Group, Cargill, Inc., SÜDSTÄRKE GMBH, PEPEES Group, Ingredion, Novidon, Avebe, AGRANA Beteiligungs-AG, Tereos, AKV Langholt, Finnamyl Ltd, Roquette, Škrobárny Pelh?imov, Manitoba Starch, Vimal PPCE, ALOJA-STARKELSEN, Lyckeby, PPZ Trzemeszno Sp., and Starch Pvt. Ltd.